What a lucky gardener I am to have a one-acre field at my disposal. Not for planting, though. Except part of it; I couldn’t restrain myself. brush hog attachment, which is, in essence, a giant rotary motor. But I mow the edges and a significant portion of the field by hand, with a scythe. So what’s so lucky about having this not-so-care-free field to take care of? Four things. First, the field offers a bit of wildness near my cultivated plants, a place where bees, dragonflies, and butterflies can frolic. Not that they can’t frolic among my cultivated plants, but there’s something to be said for what goes on among plants and soil hardly touched by human hand. Of course, rabbits, voles, and other undesirables come with the territory; I have to accept them. The second lucky thing about having this field is all the mown vegetation it provides. Mowings from the brush hog are not easily gathered, but that from my scythe is. Laid on the ground beneath my trees, shrubs, and vines, this vegetation provides mulch that keeps the soil moist and feeds soil microorganisms and plants. Stuffed into my compost bins, the vegetation is nutritious food for my compost “pet” (pile). That scything is also good for me, for the exercise. What a joy to step out in the coolness of morning and swing the scythe, stirring my “blood and [flexing my] muscles, while it clears the meadows,” to quote Scott Nearing, who lived to be 100. That’s lucky thing number three. Lucky thing number four is that I get to enjoy the beauty of the field, now dominated by yellow heads of goldenrod. Livening things up are spots of white asters against a shifting green background of grasses. And then there are patches dark green with thorny blackberry canes or red with leaves of sumac. Ah, that sumac and those blackberries. They are the next step in the field’s transition from a meadow of herbaceous plants to woody shrubs, and then on to trees. That’s what happens if Nature’s given a free hand around here. But I want a meadow. Not only that, but I notice that the ground beneath the tall goldenrod plants is quite bare of other vegetation. areas dense with blackberry canes or sumac shoots. Exposed to light, the near-naked ground should soon be dense with sprouting grasses. By selectively scything those cleared areas repeatedly next spring, grasses can regain a toehold. Grasses are the only plants that tolerate frequent mowing. A balance needs to be struck here. Too much mowing, and only grasses will persist. I’m trying for a mix of grasses with some goldenrod and other flowering meadow plants. 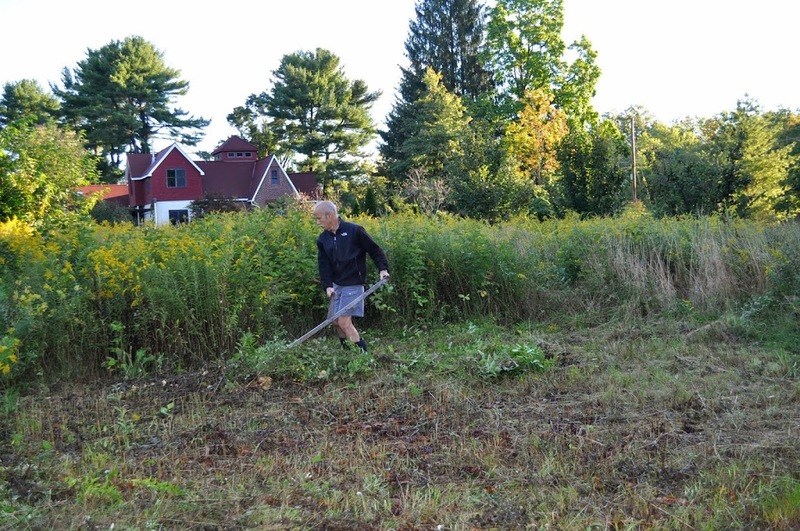 With a nod to sustainability, the question arises: In mowing the field and removing the mowings for compost and mulch, am I robbing Peter to pay Paul? As nutrients are carted off along with the vegetation, will the field yield less and less over the years. My guess is not. native minerals are unlocked over time as those minerals are solubilized by microbes and root exudates. Even nitrogen, the nutrient that plants need in greatest amounts, can be grabbed from the air (which is 80% nitrogen) and put into a form that plants can use. Leguminous plants do this with the aid of symbiotic bacteria, but soils also contain free-living bacteria and other microorganisms that can grab at the nitrogen in the air to put in the ground. So, all in all, the field presents a win-win situation, for me, for my plants, and for all the creatures, microscopic and larger, that get to enjoy it. This entry was posted in Uncategorized and tagged blackberry, goldenrod, mulch, scythe, sumac, sustainability. Bookmark the permalink. Trackbacks are closed, but you can post a comment. As one scyther to another – http://portageperennials.wordpress.com/?s=scythe, I am also trying to harvest compost material and keep the sumac down. But I’ve taken a slightly different approach. I also noticed that once or twice scythed, the goldenrod does not return. That’s fine around young trees that we have planted because they don’t like competition until their roots are well established and they start growing. But elsewhere, that’s a problem because goldenrod and New England aster are the last two major wild flowers in our area before the frost and winter. As a beekeeper I want these species. So I don’t scythe any more except selectively around young trees. So what to do about harvesting fertility? We’ve decided to grow fertility. In areas where we want the striking effect or privacy, we’re experimenting by growing Miscanthus giganteus which is sterile. Although it’s only the end of the first growing season, I’m impressed with the growth and the multiplication of stems. Per square foot, there’s clearly far more biomass. It’s too heavy to scythe but cut with bypass loppers, it should go through a light weight electric chipper quite well. We’ve also planted a 75′ foot row of basket maker’s willows in a 4′ wide bed of perennial, low-growing, Dutch white clover. The clover will provide nitrogen to the willows as well as providing a living mulch that will keep the weeds down, retain moisture, and shade the soil around the willow roots. The willows were inoculated with mycorrhizal fungi from Paul Stamets’ Fungi.com. Each year we’ll coppice the willow bed and run the whips though the electric chipper to produce ramial wood chips. It’ll be interesting to see what, if any, affect there is from the auxins found in willows. And we’ve just seeded another 75′ bed with Dutch white clover into which we’ll plant sterile Bocking 14 comfrey. We plan to harvest it a couple of times during the summer and either add it to the compost pile or produce a tea for soil drenching or foliar spraying. It should thrive with the clover because it needs nitrogen. As with the willows, the comfrey will be inoculated with mycorrhizal fungi. The sumac is a bit of a problem since we aren’t scything any more. We generally leave it it except In areas where it looks to be spreading. Then, we cut it down when it gets to a 1″ diameter size and chip it. It makes for a good source of wood chips. The remaining stump, I drill and inject Roundup into the hole with a syringe. As a Fukuoka oriented horticulturalist, I’m highly opposed to the use of Roundup but used surgically this way does specific, focused damage. Having said that, we will be experimenting with other more benign methods and will try vinegar in the holes. Perhaps a tea made from black walnut nut husks might also work although I don’t know what parts of the tree contain juglone. That’s all a bit too complicated and labor-intensive for me. My guess is that the vinegar will not work to kill stumps; it’s effective on leaves and is not translocated. As far as ramial wood chips, the only advantage over any other wood chips is that they’re higher in N than older wood chips. 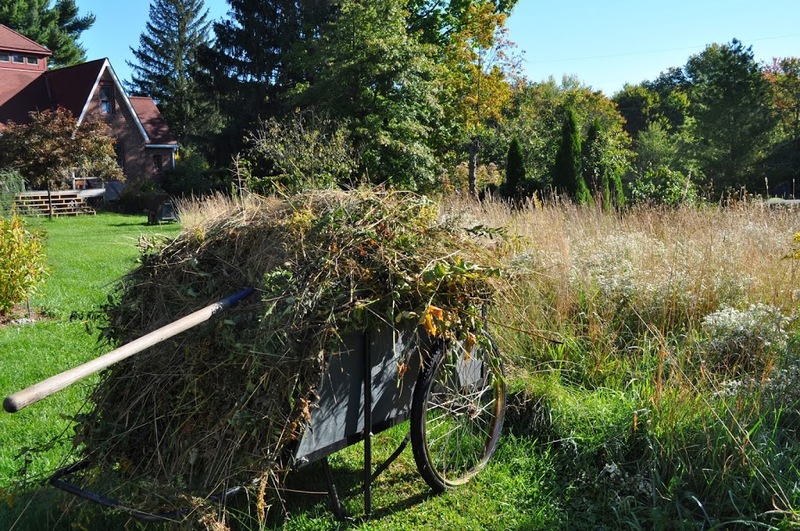 You’d get the same benefit, probably more, and with less effort growing meadow plants or grasses, scything them, and using the mowings for mulch. My Dad used to talk about his father doing the scything by the light of the full moon, to avoid the heat of the day. I also maintain a meadow for mulch – it gets mowed once a year, more often if I need the clippings.